To make a long story short, I've had to scrap plans for 100 giant dark-chocolate topped Krispy Treats, a la Disneyworld. It's hard to find a no-bake, no-craft gift that's inexpensive--but not overdone. Given the trays of cookies my husband's brought home, fruit is looking like a fresher alternative every day. All of these meet my top criteria--namely, is it something I would like to receive myself. Have you seen any novel gifts for $1 or less this season? Wow, those are some great gifts. I wish we could get that price on pineapples around here; I'd be in heaven! I once found tiny copies of The Gift of the Magi for a dollar. I've also done the Dover Thrift Edition of A Christmas Carol. My favorite, though, is a roll of wrapping paper. Now that's useful! I have never calculated the cost - but I think it could fall into the category of $1 or less...in the past the kids have made for their aunts/uncles: homemade spicy hot chex mix and homemade flavored gingerbread popcorn. This morning I've been working on our "footlong" gingerbread men/women...I think they would be fun to receive along with a packet of fancy cocoa. It would be a huge challenge to gift an adult for under $1, but if your Aldi has over 100 pineapples, I think I would snap them up and print out the pineapple history thing out on some quality paper and buy a bolt of red satin ribbon and have a long night assembling them. Granted, with the paper and ribbon, you would go a bit over a buck, but a fresh pineapple with pretty presentation would be well received, I think. For me, that would be the best idea you had. Am I correct that you have decided to not give anything this year? Maybe you could start thinking about next year right away - perhaps a beautiful handmade ornament and you could complete 10 per month so it would not be so overwhelming. Just a thought. oh, the pineapple gift sounds amazing! i have never seen prices like that! i would go with that one. today i have made three huge batches of caramel corn. i will put it in clear 1$ store bags (30 for 1 buck)for neighbors and hubby's co workers. I wondered if people might think the pineapple is a bit random...I have been given one before and was thrilled! So far, Aldi has offered pineapples for 99-cents each the week before Christmas each year. I might have to drive to more than 1 Aldi to get that many, though. Also, if anyone is using this idea, make sure you write your own short version of the pineapple's history. As far as I know, the original author has not given permission to print out and distribute. We may do only the cards this year. It is taking my husband so long to write them during the evening hours that I have no help with the kids (or free time to work on the presents). Add a sinus infection, someone else making the same rice krispy treat, the loads of baked goods already floating around the workplace--and lack of an appealing alternative makes me think the cards will have to be enough. 2009 will be a fresh start, I hope. I needed to buy work gifts for co-workers and was on a tight budget. I found really nice magnetic frames (two in a pack) in an Asian theme print with matching magnetic bookmarks (also two in a pack) in the dollar area of Michaels. I was thrilled and I think my co-workers really liked the gifts, and for only $2 a pop. p.s. that truly stinks about the treats! I love the Pineapple idea! Yum! I am wondering if they would be too "pokey" to pass out. How could you wrap them so they wouldn't gouge the recipient? Clear cellophane is expensive; tissue is too thin. Since the pineapple is the symbol for hospitality, maybe I would just write a bit about that. Can you buy them by the case from your store? I am out West, where we can do that. I think a card is plenty - bosses should maybe gift subordinates but not the other way around. Taking 100 pineapples into work and distributing them is not easy and while a nice idea it is a bit over the top. Also many people wont eat them. Buy a few for yourself and keep them prepared in the fridge. No one gifts anyone at my husbands work except the big boss man and he gave a candle to each of his people. Interesting, I didn't know aldi's had pineapple christmas specials...lol. I'll have to keep an eye out to see if mine does that. They weren't that low on Saturday yet. When my father was the manager of a store he gave all of his employees a dollar lottery scratch off ticket in a card. They had a great time scratching the tickets and a few even won!! My husband doesn't have to gift 100 employees, but we always provide a Christmas Eve breakfast in our home (cooked by the boss's wife!!). With 100 employees and your skill for putting together fabulous food parties, maybe you could do a breakfast buffet at the office - not hot stuff - just fruits, bagels, quick, easy and inexpensive things with a festive, holiday touch that you do so well. I really like the pineapple idea! For my mail carrier I bought a small package of DeMets turtles for 99 cents at Walgreens. I've spent the last few days making drink mixes and cookies to give as teachers/sitters gifts. I listed the recipe for the Mocha Expresso mix. I think the pineapple idea is great. Great price too! We live in Hawaii and I pay about twice that at our military commissary but I can't complain - the quality is excellent. I agree about the proliferance of baked goods in the workplace. My husband is a military officer and many of his coworkers and subordinates are very health/weight conscious and I know too many sweets are definitely not appreciated (this is why I also don't recommend people send cookies and candy to servicemembers in Iraq). I think fruit is a lovely gift and I really love the spice mix idea! I would definitely shop the Christmas clearance aisles with an eye towards next year. Thanks for the ideas and encouragement. I have felt so down about this. this is my husband's first year as "the big boss" as someone put it. The last 3 years I have brought in a big breakfast but I just can't transport and serve all that with a new baby on my hip! Maybe I will do something on the first day they return from Christmas break instead. What about a donation in honor of the group? With that large of a group has anyone had a personal crisis that most have rallied around? Or something the community would benifit from? Just a thought. My advice...you have a new baby and your hands are already full. Another year would be a better time! Give yourself a break!!!! OK- now that I have read. I love the note. We have so much JUNK at our school right now- a nice something for the new year would be fantastic. I am Secret Santa'd tired. I always love the stuff from the kiddos though. I love the Pineapple idea, too. It's healthy. It's classy. It's perfect. And the lottery ticket idea is cute. That is always a hit, but of course it may be frowned upon by some because it's "gambling." Can he give a gift of time such as a certificate written out that says the person can leave 1 hour early on a day of their choosing. I don't know what kind of work your dh does. Just some thoughts. Meredith, I love your idea of idea of a treat on the first day back-to-school after Christmas break. Coming back after the holidays is a bit bleak and a bit of homemade cheer will be much appreciated, I am sure. Plus it buys you a little time :). I guess I'm the only one who loves the pears as a gift. I think a pear and a card is a fabulous token gift. Especially the Bosch variety. And simpler than the pineapple. You could just put them all in a basket. Have you thought of Clementines as well? Tied in ribbon or tissue with a small candy cane perhaps? Even at more than $1/pound they are smaller so can still come in under $1. Or oranges stuck with a few decorative cloves and affixed with bows? They smell amazing and look festive. It agree with you that fruit would be a welcome relief from all the holiday sweets. Lat thought is for small packages of loose tea mix, like Earl Grey with dried lavender flowers for example. (scroll down) I'm sure you could think of something pretty to do with the packaging. Instead of token gifts, we've decided to serve a light and healthy breakfast when the staff returns from winter break. Think homemade cinnamon granola, individual yogurts, fruit, bran muffins, coffee. Served on whatever wintry blue paper products I can buy at an after-Christmas sale. All hauled over there by my husband the day before when he has free time. Exhales a big sigh of relief. Thanks for your help, as usual! I love the healthy breakfast idea. I think that after the holidays it will be especially appreciated! Don't forget to look through the Hanukkah stuff for blue paper products. And the company usually provided some sort of Christmas party and sometimes there was a Secret Santa exchange for the employees. I did have bosses that took people out to lunch on their birthday (but usually that was the direct supervisor, not the big boss). Hi! You mentioned not being able to serve with a baby on your hip. Well, I may not have a solution for your dilemma with the gift, but I can help you with the baby :-) I have three kids, 4, almost 3 and 15 months and I was totally at a loss when I had my third. Two hands, three kids, didn't work out so well. I found out how to wear my youngest. Yes, I said wear. If you go to Mamatoto.org you will find bookoos of awesome ways to wear your baby with just a simple piece of cloth. Seriously, I have an unfinished, 5y piece of cloth that I've been using for about a year now and it's soooo comfortable. They'll show you how to wrap the cloth and such. It's saved my sanity, no kidding. 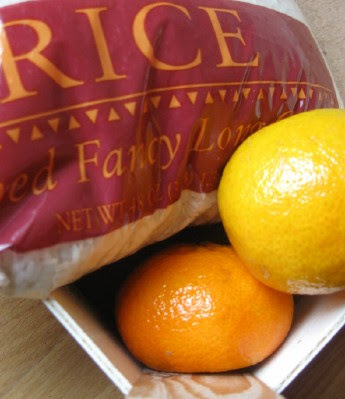 I stocked up on tangerines last week when they were on sale because they make a beautiful and tasteful gift simply tucked in a colorful gift bag. Thanks for sharing your ideas. The lemon-dill rice intrigues me. And, don't forget that list of gift ideas that Whole Foods put out a while back. Using on-sale items from your regular grocery store with these ideas could yield some inexpensive gifts as well. Your ideas are much better than any I would have generated - so creative! I love the pineapple...but would also love any of the others. Honestly, with that many people to give and a new baby I would do what is easy. I love the idea, too, of a breakfast when the teachers and staff come back. There's something about going back after the holidays that offers a fresh start for everyone, and the breakfast would be a fun way to kick off the new year. Maybe you can encourage staff to bring photos, etc, of their Christmas holidays and make it sort of a grown-up, informal "show and tell"! Sounds like a great idea, Meredith! This year my basic gift for friends & family (except my husband's family from whom this recipe comes) this year is a copy of a recipe a dish guests rave about (chicken adobo) tied to a jar bottle of rice vinegar and a little bag with 5 bay leaves (the ingredients I thought people wouldn't likely have on hand.) I intended to buy some 4 oz jars and fill with bulk vinegar to keep it cheaper but ended up buying fullsize jars for $1.89 each. Other components about 25 cents each (including bay bought in large bag at ethnic food store). 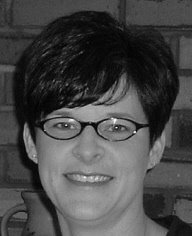 RE: the notes from your husband: when I did a similar thing for women in my mom's group I ran foldover notes through the printer to add a beginning line along the lines of "At Mother's Day, I am grateful to know a mother such as you because...." then handwrote the individual statement and signed them. I don't see that as tacky but realize some may. I applaud your determination Meredith as well as your ability to cut your losses and move on. Your post-holiday brunch solution sounds fun, and wise, to me! My husband is a teacher so we always have to come up with something inexpensive and small for his students/co-workers, etc. This year, having run out of time and creativity, I found some wonderful chocolate-covered pretzels at BJs Wholesale Club. They are big, dipped in chocolate and then covered with tiny candies or sprinkles or chocolate chips. They are individually wrapped so I am going to punch a hole in each little bag, attach a small note/gift tag, and add some curling ribbon. The box of 24 cost just $9.99!! I can handle $.42 each! I chose to gift ONE pineapple (best price here, $3.99!!!! WOW, if they were 99 cents imagine the possibilities) to our Biggest Loser instructors. It will be more appreciated than sweets, as it is on the acceptable treats list. Obviously I think a pineapple is a fine gift : ) Next, like the Bosc pears with partridge tags. In these recessionary times everyone is cutting back but if your husband feels he has to "gift" 100 people then maybe spend a bit more - say $2. I think a card is a great idea. 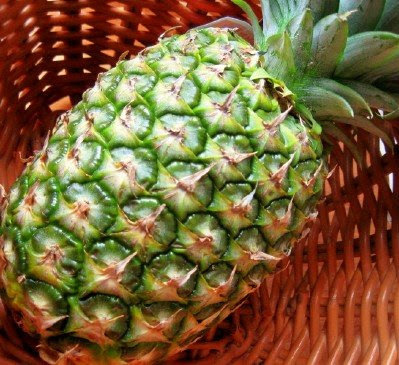 Also about the fruit - it really has to be a good piece of fruit - that pineapple looked a bit green (they dont ripen at home) maybe they should be used just for decoration - you dont want the receipient to be disappointed when eating it. I think the healthy breakfast is a better idea. I agree with Torey also. - 1 orange, a large old fashioned peppermint stick, and a homemade paper snowflake, or a favorite verse for Christmas time with meaning with a homemade gift tag. I think the breakfast after the holidays is a great idea-something cheerful for people coming back to work. As someone who isn't able to gift much this year, I would also say that I think people are a lot more understanding and a lot less judgmental about such things than we sometimes give them credit for. I have to disagree on the pineapples--ours continue to ripen at home. I have bought these same pineapples for 3 years now and have had NO problem cutting and slicing the ripe fruit by Christmas. I really can't think of much that $2/person would buy that would be significantly different than items in the $1/person and under price range. In addition to the 100 gifts, we budgeted $25 for each of 2 secretaries and then $25 each for the 4 people who work with/for him as part of the administrative team. So, $150 in addition to the 100 people...just doesn't leave me much wiggle room elsewhere. Good to know--thanks Lizzie for piquing my curiosity! "If a pineapple at the market looks green, take a look at the base. If it has begun to turn a little orange or red there, you'll be able to ripen it at home. If there is no break, the pineapple was picked too green." Excellent choice to go for the breakfast. I just don't see how one could give an individual gift to an adult for less than $1 that wouldn't seem cheap. It will take super careful planning to do the breakfast for $100 but you have proven you can "cater" meals very inexpensively. Now that your decision has been made, I hope you can relax and enjoy the holidays. Merry Christmas to you and your family! I think you have a great idea about maybe doing something the morning school starts back. That will give you time (with your dh around) over the holiday to bake. Right now (according to my dh) the workplace is loaded with goodies, mostly fattening. If you put together some healthier muffins and quick breads along with a couple of bowls of fruit for the first morning back to school, I bet it would go over very well. going from 2 kids to 3 is very hard, it was our hardest transition for sure. Don't beat yourself up, you are doing the best you can. good luck! In this economy who can afford 100 gifts??? even at a $1 or less. Thats alot of money. Oh my...I love these ideas. But promise us, Meredith, that you won't kill yourself baking bran muffins at the new year. Wal-Mart and other places have bulk trays of muffins you can get inexpensively. I figure the granola won't be that hard to make in bulk, but I just cannot picture you filling all those little muffin cups! Most people won't have to give 100 gifts--they'd have a corporate expense account or something. But there are people who earn LESS than my husband giving him nice gifts and who chipped in on a baby gift for John, so yes, I do think we owe them something in return, in fact the very BEST thing I can find on our budget. A lot of it depends on the culture of the organization. My husband is inheriting a lot of traditions in his first year in this role. Perhaps in the future we can make suggestions to scale back or divert giving to people who really need it while keeping the sentiment. Sams Club does beautiful trays of muffins and they are not that expensive - you could get 100 for $40 I bet - the last spread you did was lovely very bountiful and I think it is better to have a few really good things fresh fruit juice, coffee, muffins and fruit) Hot sausage rolls maybe - you can make them and freeze them and then cook them on the morning. I still think personal, handwritten notes of appreciation are fine on their own. But I think the breakfast at the start of the year is a nice addition. Thanks for posting this! I was struggling with time issues AND financial issues AND wanting to find a gift idea that a 7 yo could actually make. The PD's mix was perfect and we made a quadruple batch for teachers. Thank you!